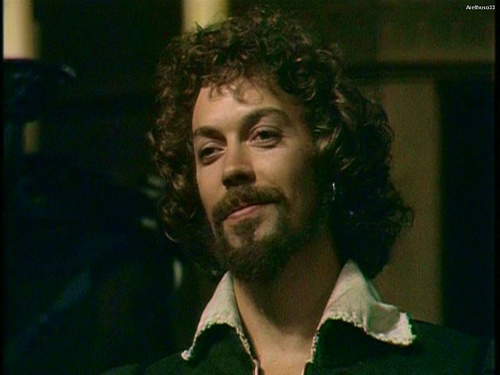 Wow, six hours of staring at Tim Curry playing William Shakespeare, and really it made me long (for pretty much the whole six hours) to see the Rocky Horror Picture Show. That would be much more entertaining. This 1978 British TV series, Will Shakespeare (also released as “Life of Shakespeare”), is a bit hard to watch. This series is six episodes on two discs and it’s available on Netflix. There are no subtitles available on these discs, and I missed them. Between the British accents and background music/noise it was hard following the first disc. The second disc didn’t give me as much of a problem (maybe I got used to the accents). I was excited to see my friend John McEnery in this series. I loved him as Mercutio in my old favorite, Franco Zeffirelli’s Romeo and Juliet. Unfortunately, here he is wasted as a neighbor in Stratford. There is no need for this character, who appears to just hang out a lot with Shakespeare’s wife Anne Hathaway while Will is away in London. I guess it would be awkward to have Anne talking to herself, so they placed an extra body in the room. Too bad. Then we have Curry as the Bard. 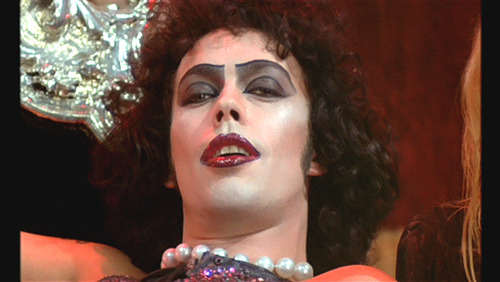 I am not a huge Tim Curry fan, although I like the Rocky Horror Picture Show. He is totally trapped in that Dr. Frank-N-Furter character for me (even more, maybe, than Keanu Reeves will always be Ted on an excellent adventure). Frank-N-Furter, yes. Shakespeare, iffy. Very iffy for me. Especially as the young, curly-haired Shakespeare of the first disc where he looks just like Frank-N-Furter (this series was filmed only a couple of years after Rocky Horror). 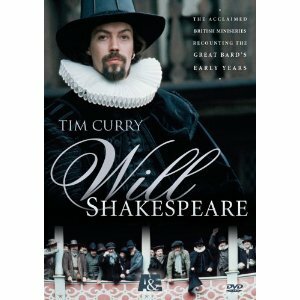 For me, Curry as Shakespeare lacks the charm of say, Joseph Fiennes in Shakespeare in Love. He has a creepy/sinister thing going that is difficult to get past. Matter of fact, a lot of this series suffers from creepy/sinister. The first episode centers on Christopher Marlowe. There is a long creepy/sinister scene in a (spa? club? bathroom?) with lots of mirrors and Marlowe’s head in a mud mask. Weird. Marlowe’s creepy/sinister boy toy is involved in underhanded shenanigans and a hard-to-follow payola thing that contributes to the end of Marlowe. Whatever. Then there is creepy/sinister actor Jack Rice, whose mother’s body is quietly dumped by Shakespeare in the river to avoid alerting the authorities who would close down the theater if they knew she died of plague. Jack loves to play the girl parts in the plays and whenever he is on the scene in his heavy makeup and admiring himself in the mirror, I am reminded of Tales from the Crypt. The creepy/sinister theme continues with the Earl of Southampton, who is shown over and over and over again on the first disc dining with Shakespeare at opposite ends of a 30 foot table while they silently stare daggers at each other, apparently having a lovers spat over Shakespeare’s unrequited infatuation with his dark lady of the sonnets. The second disc continues the creepy theme. Creepy/bitchy Anne Hathaway. Creepy/silent son Hamnet. Creepy/terrifying Queen Elizabeth. And it is creepy the way Shakespeare ages and balds while Southampton remains lovely. In addition to creepiness, there are extended, hard-to-follow intrigues involving Southampton and Essex and the Queen (and maybe Shakespeare). I did not really follow the plot a fair amount of the time, and by the end of the six hours I didn’t care.